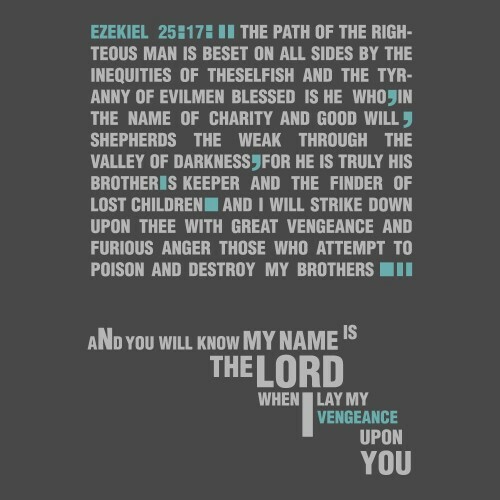 Tarantino isn’t quoting Ezekiel here. also, ‘theselfish’ is not a word. Fail on you for not seeing what he did there. And not all bibles have the same lines, word for word. Alot of the time, they change the sentence, but keep the meaning. @natedog: He just forgot a space. A thesel fish is a now extinct fish that used to live in the Dead Sea. They had built a massive empire and lived a life of decadence while the Jews were servants of the thesel fishes. The Jewish uprising against the thesel fish is supposed but not confirmed as the scrolls for this part of history are lost. It’s not in any bible. Tarantino has admitted he made up the quote. And it was originally in his script for From Dusk Til Dawn (spoken by Keitel’s holy man) but he got to make Pulp Fiction first and re-used it. Along with ideas from about a hundred other movies. @kezia347: If Tarantino’s made-up excerpts of the Bible was an influence in you becoming Buddhist, I don’t think that Christianity has lost a great scholar or anything. Terrible graphic design is terrible. The simple idea that there are people out there that thing -this- is good means that more people need to be shot. The bible is made up anyways so the passage from the bible used in plp fiction is just tarantinos revision. There is the king james bible,.. now there is the tarantino bible. @kishi you are entitled to your opinion… i wasnt talking just about tarantino’s movie quote. There are so many valid, real world reasons to disagree with Christianity, it’s fairly stupid to invoke fully made-up examples. @Kishi: It’s not a *fully* made up quote, it’s a *mostly* made up quote. It’s still based off an actual passage, and I’m pretty sure kezia meant the vast plethora of quotes in the bible that are very much like this quote, with the same hellfire and damnation zest to them. The fact that people can easily believe this Pulp Fiction quote was straight from the bible attests to that. Crawl back outta his or her nasty, sheesh. are all of you talking about the bible, the sci-fi bestseller?